I learned to appreciate Mexican food in Chicago and Texas, but mostly in Mexico. In the early 70's, Bruce and I made two trips to Mexico. The second one we drove down the entire Pan-American highway. Wonderful! We brought our two boys which was a big advantage because Mexicans absolutely love children and they welcomed us warmly every where we went. In Chiapas, the peasants invited us into their thatched huts. In Merida, near the Guatemala border, we met the Mayans. The influence of Mexican cooking is seen in the American Southwest in the states of New Mexico, Arizona, Texas and southern California. 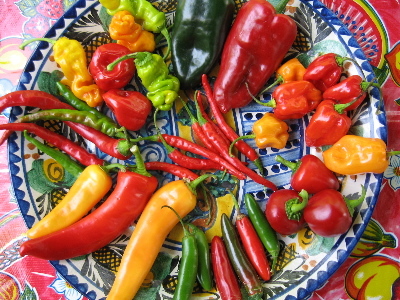 Read about Mexican Cooking and French Influence. A good cookbook on Mexico - actually, a good cookbook on any cuisine - should be like a conversation with a friend about good food. OK, so in this case that friend may be a cookbook author, say Rick Bayless or Diana Kennedy, but consider them friends nonetheless. They'll be enthusiastic travel guides, providing insight into Mexico's cuisine and culture. Bayless and Kennedy aren't the only guides to Mexican cooking, of course. A search via Amazon.com through "Mexican cooking" books kicked up more than 2,800 titles - and that was before an editor dropped two new cookbooks - Daniel Hoyer's "Mayan Cuisine: Recipes from the Yucatan Region" (Gibbs Smith, $34.95) and a new edition of Diana Kennedy's "The Art of Mexican Cooking" (Clarkson Potter, $30) - on my desk. Here are five other books that are worth perusing. Some can be found at bookstores, others online; some are available new, others used. "Authentic Mexican: Regional Cooking from the Heart of Mexico," by Rick Bayless with Deann Groen Bayless (Morrow, $30). Bayless has captured the heart and soul of Mexican cooking and "translated" it for cooks in this country. Possessing a researcher's hunger for information, he happily relates stories from his travels, along with recipes that are both simple and complex. A bonus: the "traditional variations" he offers with many recipes. Speaking of recipes, try the pork and chipotle chili stew called tinga poblano . "My Mexico: A Culinary Odyssey with More than 300 Recipes," by Diana Kennedy (Clarkson Potter; $37.50). Not all cookbooks are thick with recipes. This book has lots of them: from tamales to pollo en salsa cacahuate (chicken in peanut sauce). But pick this up to travel along with Kennedy on her adventures trekking about the country, poking around markets in Puebla, the kitchens of Jalisco and wedding preparations in Oaxaca. "Pre-Hispanic Cooking/Cocina Prehispanica," by Ana M. de Benitez (Bibliotech Interamericana Bilingue, $35.95). This tiny paperback, half in English, half in Spanish, is packed with intriguing nuggets of information drawn from Mexico's traditions, the writings of Spanish missionary Fray Bernardino de Sahagun and Benitez's years as a cooking teacher. Images in the book's margins are drawn from ancient codices and manuscripts. An easy-to-read resource for pre-Hispanic culinary information and only a few recipes you might want to tackle. "The Taste of Mexico," by Patricia Quintana (Stewart, Tabori & Chang, $50). A beautifully photographed tour of the country with recipes to match. Quintana, a cooking teacher now restaurateur (Mexico City's chic Izote de Patricia Quintana), takes readers on a culinary tour of Mexico's regions (the Gulf, the Bajio, the South Pacific Coast, etc.) offering recipes ranging from pipian verde (delicious duck in a green pumpkinseed sauce) to los escamoles estilo pachuquilla (a dish we haven't tried because it's tough to find ant eggs at the local grocery).